The Sonos Connect:Amp with a single Sonance C6R SST Invisible 6.5" Stereo Ceiling Speaker is the ideal bundle for smaller rooms to integrate multiroom audio. If you want the beginnings of multiroom audio or want powerful sound in a smaller space, this fantastic multiroom system from Sonos with single stereo speaker by Sonance is perfect to consider. The Sonos Connect:Amp & Sonance C6R SST Invisible 6.5" Stereo Ceiling Speaker Bundle comes with everything you require to wirelessly fill your full room or home with audio; Sonos Connect:Amp, one single 6.5" Sonance C6R SST stereo ceiling speaker and speaker cable to install. A Sonos Connect:Amp sound system gives you the ability to use your phone, tablet and laptop computer to stream music around your home wirelessly. When the Sonos Connect:Amp is brought together with the Sonance C6R SST Invisible 6.5" Stereo Ceiling Speaker, you have the start of a true Multiroom Sound System. This speaker is perfect for use in smaller rooms or apartment rooms within minimal space, where you want audio, discreetly installed, and with suitable sized speakers. Please take note that one Sonos Connect:Amp is required for each room/zone, so for a true multi-room set-up in additional rooms/zones, just select the correct quantity needed at checkout. This Sonos Sound System enables you to play a different song in each room throughout your home, or for full flexibility bring together zones to play all at once, and the Sonos app will allow you complete volume control as well. This Sonos Connect:Amp Ceiling Speaker Bundle enables you to stream directly from mobile devices, whether it is stored music or via your favoured music streaming services such as Apple Music, Spotify, Google Play, Amazon Music, Last.fm, Deezer and many more. It also features pre-loaded internet radio stations providing you endless music to enjoy from any device connected to your WiFi network running the Sonos app. Control your audio with ease through your WiFi devices or connect other devices to your Sonos Connect:Amp through an analogue audio input that also allows you to connect your TV, DVD, HiFi, MP3 players etc. Line-In Connections: Auto-detecting analog (RCA) line-in connection. Amplifier: Class-D. 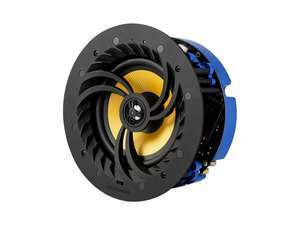 Rated output 110W RMS (2x55W continuous average power into 8 ohms, THD+N<0.02%) with both channels driven, 22Hz-20KHZ-AES17 measurement bandwidth.